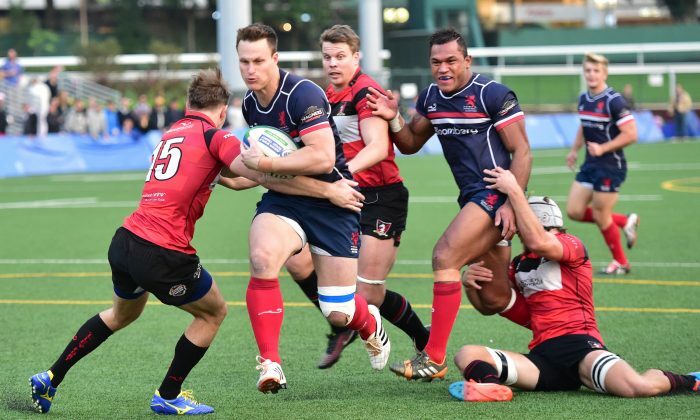 HONG KONG—With 10 of the 15-rounds of the Hong Kong Rugby Football Union Premiership 2014/15 completed, Leighton Asia HKCC edged ahead of Bloomberg HK Scottish with their bonus point 41-10 win over Abacus Kowloon at Aberdeen Sports Ground on Dec. 13. Although HK Scottish won their match at Valley-8 against 3rd placed Societe Generale Valley, they were denied a ‘bonus point’ fourth try to keep up with the leaders. The match finished 24-10 in favor of HK Scottish. In the match at King’s Park, Natixis HKFC won a closely fought contest with bottom of the table Borrelli Walsh USRC Tigers which finished 29-27 to HKFC. HKFC again came from behind in the second half with tries by Steve Nolan, Niall Rowark and Jonny Reece to give them the win and a bonus point for the fourth try. HKCC racked up 6-tries in their demolition of Kowloon and showed why they are at the top of the Premiership standings. Although they have lost matches against HK Scottish and HKFC, HKCC have racked up 5 try-bonus points and have a handsome 44-points difference over the second placed team (132 to 88). HK Scottish on the other hand have only lost one match (HKCC), but they drew against HKFC and they are behind HKCC on try bonus points, having only gained 2-try bonus points so far. Valley with a number of regulars missing struggled to get their game in tune for much of the match. HK Scottish put the pressure on from the start scoring an early try through David Bird who also kicked the conversion and a penalty to take Scottish into a 10-3 lead at the break. Valley scored early in the second half with an Andrew Bridle try which was converted to level the score. But HK Scottish kept pushing and scored tries through Bryan Rennie and Andrew Henderson together with the conversion kicks gave them the 24-10 win. Valley defended well late in the game to deny Scottish the bonus point fourth try. HKCC now have 37-points, HK Scottish have 36-points, Valley are on 29-points and HKFC have moved to 22-points, closing the gap on Valley to 7-points. Kowloon are on 16-points with USRC Tigers struggling on 2-points. The next round of fixtures starts on Jan. 10, 2015 when Kowloon and HKFC both have tough away matches to face against Valley and HKCC respectively but with 5-matches to play all teams meet each other once again before the end of the Premiership. Fittingly HKCC and HK Scottish will meet on the last day of the Premiership on Feb. 7 as will HKFC and Kowloon, but HK Scottish will have the easier draw against USRC Tigers on that final day.